How can we help you enjoy your celebration? 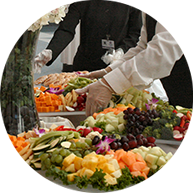 Professional serving staff is not only for weddings or more formal parties. For over 15 years we have been helping our clients enjoy holiday parties, landmark birthdays, christenings and baby naming’s, religious celebrations, neighborhood parties, and any social event you may want to host. If your family is experiencing the loss of a loved one, take the pressure off those who are grieving by calling in our team to serve the guests attending the gathering after services have concluded. Any location. Your home, a county park, a museum, a church hall, an event venue or a service organization event room. We can serve you. Select your food, location, entertainment or any other needs from any provider you choose, or from our partners and know you will receive the best service available from trained professionals with a reputation of trust and competence. Relax, and enjoy your event while our trained teams set up, serve, bar-tend, manage the grill or ovens, clean up and take care of all the details of your event. Personal chefs, caterers, entertainers, photographers, bakery, restaurants, and event venues, are available but you are not compelled or required to use any of our suggestions. Please see our resources page if you need ideas or contacts. We are pleased to work with any provider you choose, or with your friends or family members who want to provide the food, entertainment or services for this special occasion. Our rates are competitive with other local providers and once you try our service you will never want to have a party or event without our team. Please contact me for any questions, to schedule your service staff or to get more information about how we can help you. If you have quality services to offer such as floral, entertainment, rental hall, catering, bakery, or photography please contact me so we can discuss listing your resource here.